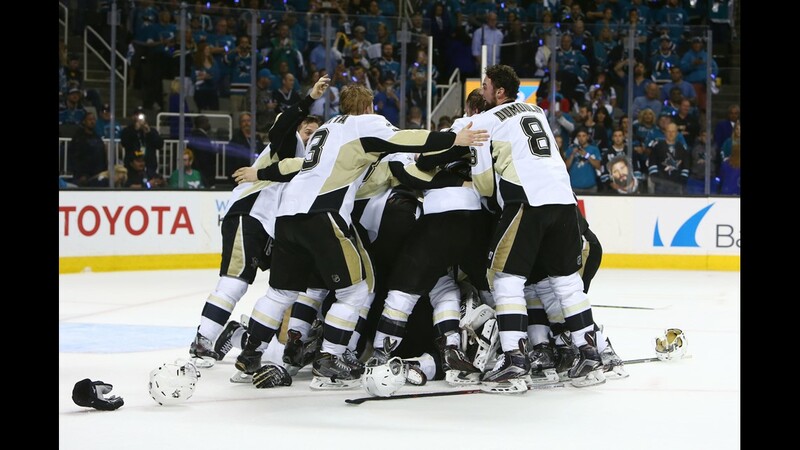 SAN JOSE, California (NEWS CENTER) -- With a 3-1 win over the San Jose Sharks, Biddeford native Brian Dumoulin became the first Maine-born NHL player to hoist the Stanley Cup. With Sharks forward Dainius Zubrus in the penalty box for tripping, Dumoulin went to work scoring a power-play goal at 8:16 of the first period. The Penguins held a 2-1 lead late into the third after Kris Letang found the answer to a Logan Couture goal in the second. SAN JOSE, CA - JUNE 12: Brian Dumoulin #8 of the Pittsburgh Penguins celebrates his power play goal with teammates Justin Schultz #4 and Conor Sheary #43 during the first period of Game 6. Pittsburgh Penguins defenseman Brian Dumoulin (8) skates with the puck against the San Jose Sharks in the first period in game six of the 2016 Stanley Cup Final at SAP Center at San Jose. Pittsburgh Penguins defenseman Brian Dumoulin (8) skates with the puck against the San Jose Sharks in the first period of game six of the 2016 Stanley Cup Final at SAP Center at San Jose. The Pittsburgh Penguins celebrate a goal by defenseman Brian Dumoulin (not pictured) past San Jose Sharks goalie Martin Jones (31) in the first period in game six of the 2016 Stanley Cup Final at SAP Center at San Jose. Nov 17, 2015; Pittsburgh, PA, USA; Pittsburgh Penguins defenseman Brian Dumoulin (8) turns up ice against the Minnesota Wild during the second period at the CONSOL Energy Center. The Penguins won 4-3. Brian Dumoulin #8, Patric Hornqvist #72 and Sidney Crosby #87 of the Pittsburgh Penguins stand on the ice prior to Game Three of the 2016 NHL Stanley Cup Final against the San Jose Sharks at SAP Center on June 4, 2016 in San Jose, California. Brian Dumoulin celebrates with his teammates after defeating the Tampa Bay Lightning in Game Seven of the Eastern Conference Final with a score of 2 to 1 during the 2016 NHL Stanley Cup Playoffs. Dumoulin celebrates with his teammate Chris Kunitz #14 after scoring a goal against Andrei Vasilevskiy #88 of the Tampa Bay Lightning during the first period in Game Five of the Eastern Conference Final during the 2016 NHL Stanley Cup Playoffs. Dumoulin prepares to take the ice prior to Game Seven of the Eastern Conference Final against the Tampa Bay Lightning during the 2016 NHL Stanley Cup Playoffs at Consol Energy Center on May 26, 2016 in Pittsburgh, Pennsylvania. Thornton of the San Jose Sharks skates against Dumoulin during the third period in Game Two of the 2016 NHL Stanley Cup Final at Consol Energy Center on June 1, 2016 in Pittsburgh, Pennsylvania. Brian Dumoulin of the Penguins celebrates with his teammate Kunitz #14 after scoring a goal against Vasilevskiy #88 of the Tampa Bay Lightning during the first period in Game 5 of the Eastern Conference Final during the 2016 NHL Stanley Cup Playoffs. PITTSBURGH, PA - JUNE 01: Brian Dumoulin #8 of the Pittsburgh Penguins skates during the first period against the San Jose Sharks in Game Two of the 2016 NHL Stanley Cup Final at Consol Energy Center on June 1, 2016 in Pittsburgh, Pennsylvania. Brian Dumoulin #8 of the Penguins celebrates with his teammates after scoring a goal against Vasilevskiy #88 of the Lightning during the first period in Game 5of the Eastern Conference Final during the 2016 NHL Stanley Cup Playoffs. Brian Dumoulin #8 of the Pittsburgh Penguins and Tomas Hertl #48 of the San Jose Sharks fall on the ice during the second period in Game One of the 2016 NHL Stanley Cup Final at Consol Energy Center on May 30, 2016 in Pittsburgh, Pennsylvania. Pittsburgh's fourth championship in franchise history comes on the seventh anniversary of their last championship. Dumoulin scored his first playoff goal of the season in the Conference Finals, as the Penguins fell to the Tampa Bay Lightning in Game 5. From his back-to-back state championships as a Biddeford Tiger to two titles while skating for Boston College, every team that defenseman Brian Dumoulin has been a part of has found success thanks to his help. Through it all, his family says, he remains humble, even now with his name soon-to-be etched in the side of the most coveted trophy in sports.